The Avalon 16 Inch 360 Degree Adjustable Floor Fan is an energy efficient fan with innovative design. It has been constructed with a durable copper motor to last longer. This powerful floor fan is perfect for cooling a bedroom or an office. The 16 inch head gives you the option to place it on the floor, on a dresser, or on a table. The 3 fan speeds give the option of how cool you want the fan to blow. The fan head can be adjusted to any angle and can pivot a full 360 degrees. This will allow it to blow in any direction you choose, even completely upward or downward. This fan has been ETL listed with UL approval and employs overload safety protection with a fuse in the plug. Please note that during the first few minutes of initial use, you may notice a slight odor due to lubrication of the motor at the factory. This is normal and will quickly disappear. FLOOR & TABLE FAN: Avalon's Adjustable High Velocity Floor Fan features a stand that can conveniently rest on any flat surface, making it appropriate for use as a table fan as well. ADJUSTABLE FAN HEAD: Our high velocity floor fan is adjustable, can tilt to any angle, and can pivot a full 360 degrees, allowing you flexibility and providing widespread coverage. DURABLE & LIGHTWEIGHT: Our high velocity fan features a durable copper motor which provides a super strong fan speed and is built for overall long lasting performance. THREE POWERFUL FAN SPEEDS: Avalon's High Velocity Fan features 3 energy efficient speed settings & a durable motor that provides strong performance no matter the weather. SLEEK & STYLISH DESIGN: This high velocity fan features a sleek & stylish design that is neutral & won't clash with your decor no matter the environment. Use it anywhere. 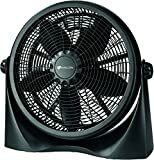 Avalon Adjustable Table Fan or Floor Fan - 16 Inch - 360 Degree Vertical Tilt, Durable & Lightweight, 3 Energy Efficient Fan Speeds -UL Approved, Black out of 5 based on ratings.